Shimla, Feb 9 (IANS) Himachal Pradesh's popular tourist destinations Kufri and Dalhousie received more snowfall on Saturday leading to a drop in temperatures by several notches. 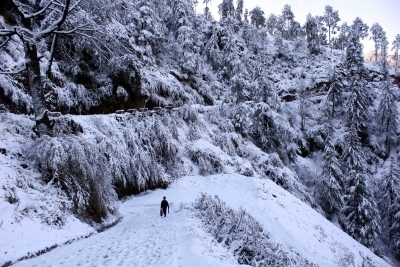 Snow could be seen in large areas of Shimla like the Mall Road, Ridge, US Club and Jakhu Hills and would remian for a one-two days. The Met Department said the western disturbances -- storm systems originating from Caspian Sea in the Central Asia and moving across the Afghanistan-Pakistan region -- receded from the region and dry weather would prevail in the next few days.